This is the first game in the Excite series. For other games in the series see the Excite category. Excitebike (エキサイトバイク, Excitebike?) was one of the more popular launch titles for the NES, but its popularity was due in large part to the games presence in arcades. Though primitive by today's standards, Excitebike builds its gameplay, and subsequently its popularity, on a pure game design concept. There is no back story or integral characters to know. The player merely assumes the role of a motorbike racing contestant whose aim is to become the champion. The controls are simple and intuitive, and the experience is fun, as you guide your bike over ramps and jumps, and trip up the competition. When Excitebike was programmed for the Famicom, it including a track edit mode where players could design and play on their own tracks. These tracks were saved on the Famicom cassette recorder that was also used with Famicom BASIC. It was the fifth best selling Famicom game released during 1983 and 1984, selling approximately 1,570,000 copies in its lifetime. When the game was released outside of Japan, the edit mode remained, but there was no way to physically save the tracks. 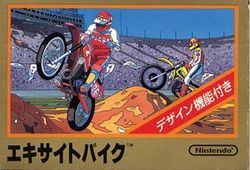 This version of the game was published for the Game Boy Advance e-Reader card system (without the track save feature) as Excitebike-e, and then again as part of the Classic NES/Famicom Mini series of NES games on the Game Boy Advance with the ability to save one track. 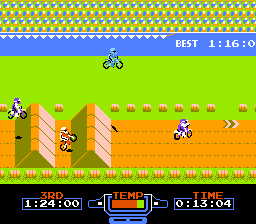 Vs. Excitebike was released in the arcade shortly after the Famicom release, partially in an attempt to create a demand for the home version in the United States. The Vs. version was later released on the Famicom Disk System with some improved features. The game's lasting legacy led to Nintendo 64 sequel called Excitebike 64 (which included the original game as a minigame), as well as Excite Truck for the Wii. : Move to a higher race lane. : Move to a lower race lane. : When in the air, push right to lower the front wheel. This causes the bike to fly lower and longer. : When in the air, push left to raise the front wheel. This causes the bike to fly higher and shorter. When on the ground, push left to do a wheelie. If you push left for too long, you will fall off the bike. : Normal acceleration. This will only heat your engine up to a certain extent. : Turbo acceleration. This will continue to heat your engine up to the point where it can over heat. If you over heat, you will be forced to move to the side of the track until your engine cools down enough for you to continue. Drive over Turbo Strips to cool the engine down. + : When knocked off the bike, tap the two buttons rapidly to run faster. Selection A: In this mode, you must complete two solo laps on each track. Selection B: In this mode, you must complete two laps with competition on each track. Design: You can construct a track of your own design, and race on it. In order to take first place, you must beat the record score that scrolls by on the wall behind the track. In order to qualify for the next race (3rd place in Excitebike, 5th place in Vs. Excitebike) you must at least beat the time indicated in the lower left corner of the screen. The most important thing to consider while racing is the orientation of your bike in the air. You will lose a considerable amount of time if you don't land with both wheels on the ground at the same time. Always orient your bike parallel to the ground before you touch down for the fastest times. Judge whether you want your bike to travel high and short, or low and long when you go off a jump. Most of the time, low and long will help you travel farther faster, but some jumps require that you jump high to avoid crashing in to the next ramp. Use the turbo acceleration off the start line and just before going over jumps. Let go of when you are on straightaways and already in the air. Holding too long can cause your engine to over heat. If it does, you will be forced to wait for your engine to cool down, losing precious seconds. In addition to watching the temperature gauge at the bottom of the screen, listen for the engine sound to change from a hum to a whine as an indication of over heating. Look for Turbo Strips on the bottom or (more commonly) on the top of the track. They instantly reduce the heat of your engine, allowing you to hold down without penalty. If you hit the rear wheel of another racer or land improperly, you will fall down and have to run to your bike. Tap and as fast as you can to speed up your recovery. However, if you can get your rear wheel in front of an opponent's bike, you will trip your opponent and send them off to the other side of the track, taking them out of competition for a short while. Even if a competitor is removed, you still have to beat the time posted. You must perform a wheelie to cross the small bumps in the road that are no higher than your front tire. Try to avoid driving on the grass, or driving through mud as they both slow your bike down considerably. This page was last edited on 9 June 2018, at 18:19. This page has been accessed 56,270 times.